What is the Mini Masters? Congratulations to 2018 M.C. Mini Masters Putterz Division Champion Tommy Schweiss! Congratulations to 2018 M.C. Mini Masters Puttz Division Champion Tom Schweiss! Congratulations to Matthew Cullen on his fourth holes-in-one title! Congratulations to 2018 M.C. Mini Masters Rookie of the Year Lynn Bryant! Tommy Schweiss was also the 2018 M.C. Mini Masters Most Improved trophy winner! Congratulations! LINDENHURST, IL--Tournament Director Mick Cullen is fully invested in preparations for the 21st M.C. Mini Masters, to be held Saturday, June 24, starting at 8:00am. He has fully retaken the reins after a hiatus of varying degrees over the last few years. At this point, the course schedule is likely to be the same as last year, though there are some considerations still being made. 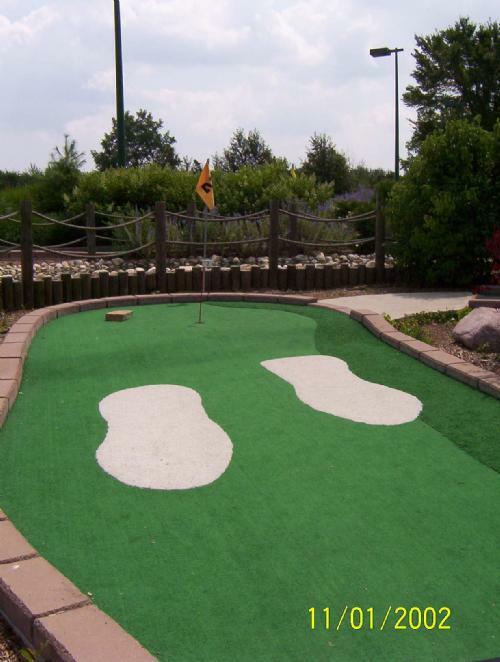 Currently, the plan is to play two courses at Action Territory in Kenosha, Wisconsin (Wild West and Wisconsin Adventure) to start the day for the third straight year, followed by Lighthouse in Waukegan, Illinois (making its 20th MCMM appearance in 21 years), Aloha Falls in Libertyville, Illinois (12th appearance), and finally closing the day out with two rounds at Par-King in Lincolnshire, Illinois (10th appearance). Lighthouse does not open until this coming weekend, and so no reservation has yet been made at the course. If there seems to be an issue with returning to Lighthouse, it is likely that the tournament will instead play all three courses at Action Territory, bringing the original course at that location (now renamed Lost Falls) back into the fold for the first time since 2012, its 17th inclusion in total. Cullen has hopes that this year's tournament will go more quickly than others, since veteran putter Lisa Curran will be acting as full-time scorekeeper this year, tallying all scores on the official laptop. This will enable the group to move on to the next course quickly, saving the time at the end of each course when data is normally being entered. This may make it possible to end the day by 8:30pm or possibly even earlier; while still making for a long day, it's a big potential improvement. Mick is also the tournament's defending champion, having defeated Zach Reichert on the first hole of sudden death last year after they finished the 6th round knotted at 19 under par. Mick's run of four championships in the last six years has given him a total of five, just two short of his father Michael Cullen's all-time record of seven titles. Michael announced his Mini Masters retirement this spring and will not be returning to try to best Mick, but two other past champs, Tom Schweiss (4 wins) and Matthew Cullen (3 wins), are planning to try to reclaim the crown this year. The only other MCMM victor of the past, R.J. Dusak (2005 titleist), has not yet indicated whether he will play this year. To date, 25 players have indicated they will attempt to complete the tournament this year--two rookies (Pam Powroznik and Matthew Rosenberg) and 23 veterans. More players are expected to join the fold. If you're interested in participating in this year's Mini Masters, email Mick at ptarmigan61@gmail.com! MCMM Invitational Director and 2014 MCMM Invitational Champion, Matthew Cullen, confirmed earlier today that the 2nd Annual MCMM Invitational will be played on Saturday, September 26th, with the first round teeing off at 11:30. The venue for the tournament will most likely be Action Territory in Kenosha, WI, though a rogue group of participants are petitioning to have the tourney at Aloha Falls in Libertyville, IL. The leader of the pack, Golfer X, was encouraged by the number of signatures they had so far, stating, "Those of us who have signed already are very passionate about keeping the tournament in our country!" When informed that the Kenosha, was in Wisconsin, and not Canada, Golfer X became disoriented and walked off mumbling to himself. Cullen indicated the deciding factor for the venue may come down to corporate sponsorship. "I am in the process of negotiating sponsorship opportunities with various companies, including Dr Pepper, Zatarain's, and Johnsonville Brats. Although Dr Pepper and Zatarain's may not care, the Illinois venue may be a deal breaker for a Wisconsin company like Johnsonville. We would be unwise to walk away from something that big." He further added that if everything worked out as he plans, there would be a BBQ after the tourney with brats, soda, and red beans and rice. Although nothing works out as he plans. Officially the field stands at 14 confirmed, with rumors as to who will fill the last two participant slots. While some believe Tiger Woods and Phil Mickelson will make a rare appearance, there are those who think this is ridiculous. "I'd rather have Fuzzy Zoeller and Chi-Chi Rodriguez out here. T-Dubs and Philson can't handle the short game," says Eli Cullen, MCMM Invitational veteran and winner of the Best Knock-Knock Joke of the 2014 tourney. Only time will tell how the 16 putters will be rounded out. With a little more than a week left before the first ball is holed, the anticipation is, well, anticipated. It is sure to be a good time, as is natural with any MCMM event. Who will get the Ugly Plate as this year's champion? Who is going to come in last and receive the 16th Place Thrift Store T-Shirt? What will the giveaways be this year? We'll find out when it all goes down the 26th. If all goes according to plan, this year's Mini Masters will start at two courses that are less than a year old-- Wisconsin Adventure and Wild West, both at Kenosha's Action Territory. Negotiations are underway to bring the Mini Masters back to Kenosha for the first time since 2012, thanks to the presence of these new courses at Action Territory, which hosted the inaugural MCMM Match Play Invitational last September. Lighthouse will be making its record 18th appearance in the Mini Masters, Aloha Falls its 10th, and Par-King's courses their 8th. An interesting bit of potential MCMM history comes with the new courses, of course. Matthew Cullen is the only player with a hole-in-one on all 14 courses that have been used in the Mini Masters, and he could become the first player to log 16 if he can get a hole-in-one on each of the new courses. None of the five players with 13 different courses on his/her list is missing a course that is still being used in the MCMM--Mick Cullen lacks Ballybunion while Stephanie Altergott, R.J. Dusak, Karen Kemnitz, and Tom Schweiss are all missing Rocky's Fun House Waukegan (which was only in the MCMM once). Dianne Cullen, Michael Cullen, and Jason Gola are each missing two courses that are also not in the tournament this year (and in Dianne's case, she is missing one course that no longer exists). In all, 14 players are solely missing courses that are still in operation but aren't currently being used in the Mini Masters. In short, no one other than Matthew Cullen will be able to complete the 16-course ace list without a former MCMM course reentering the fold. Ballybunion, Rocky's Fun House Waukegan, Congo Rapids, Congo Falls, the original Action Territory, and Kristof's all could theoretically reenter the tournament lineup at some point, though that is more likely with some than others. In the case of Sisolak's West and East, Congo River Kenosha, and Rocky's Fun House Gurnee, those courses have either been demolished or left to decay and fall victim to vandals-- MCMM veterans missing those courses will never be able to complete their lists. What other history can be made this year? Matthew Cullen's first hole-in-one will make him the second player in MCMM history to reach 100 aces. Michael Cullen can join the club if he cards at least eight holes-in-one in 2015. Jason Gola would have to set a new MCMM record with 13 in order to reach the century mark himself. With 54 twos, Gola can become the fourth player to reach 1,000 deuces. With one more eagle, he'll become the fourth player with 50, and with 19 birdies, he'll become the fourth player with 500. Three players are within reach of 100 career double bogeys-- Karen Kemnitz (94), Julie Schweiss (93), and Carolyn Howard (91). They could join the three current members of the 100-double-bogey club: Lisa Curran (112), Josh Altergott (104), and Gola (100). 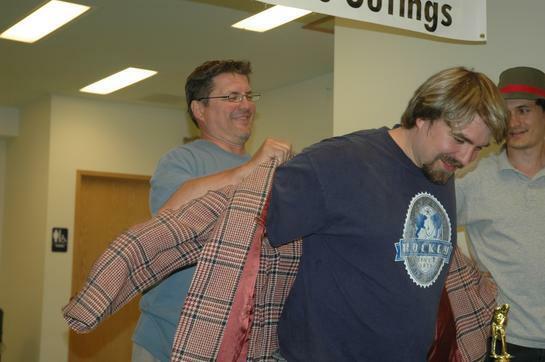 If either Mick Cullen or Tom Schweiss can win the Ugly Jacket, they'll inch to within one of Michael Cullen's all-time MCMM record of six titles. Matthew Cullen can tie them with his 4th Ugly Jacket if he triumphs instead. If any Putterz Division player other than Dianne Cullen, Brady Neal, or Gola wins that division's title, that will be the fifth different Putterz Division champ since the division was instituted in 2011. With one more course title, Michael Cullen would be the first to reach 25 for his career. One more for Tom Schweiss would make him the fourth player to reach 20. Matthew and Mick Cullen are currently tied for the all-time lead with 18 sub-40 rounds; two more for either one of them would make that player the first to 20. With two rounds of 60 or higher, Carolyn Howard would be the first player in MCMM history to achieve 20 such rounds. James Morren's lifetime score range is 43 to 78, a remarkable 35-stroke difference. That places him second all-time to Lisa Curran's 40. If Morren could record a 38, he'd match Curran's mark. Josh (pictured above right) & Stephanie Altergott and Julie Schweiss each have 23 different scores for single rounds in their Masters careers. If any of them can record two new scores, he/she would be only the second person to reach 25 different scores (Curran has 28). Michael and Mick Cullen will each be trying to record their 10th sixless tournament, still short of Matthew Cullen's all-time record of 12 (and counting). If he can get a hole-in-one on a hole he's never aced, Mick Cullen would be the first to sink his first putt on 75 different holes in MCMM history. The following players can join the 1-through-18 hole-in-one club by recording an ace on a hole with the number(s) following their name in parentheses: Michael Cullen (2), Carrie Donahue (13), R.J. Dusak (13), Julie Schweiss (9), Stephanie Altergott (8 and 14), Ursula Cullen (2 and 13), and Dan Lee (3 and 13). With two holes-in-one on Wacky Holes, Michael Cullen would be the first to have ten such aces in his career. With one ace at Lighthouse, Mick Cullen would become the first MCMM player with 25 holes-in-one on a single Mini Masters course. With one hole-in-one at Par-King Black, Tom Schweiss would join his wife Julie as the only player to reach double figures in aces at that course. 2014 MCMM Invitational - Lightning Strikes Again! Despite the forecasted thunderstorms expected throughout the day, last Saturday's first annual MCMM Invitational was a mostly sunny experience for the field of 16. While the fourth round of the tournament was delayed a half hour due to a short burst of rain and lightning, the competitors in the match-play tournament were able to finish putting and crown one putter champion. Even before everyone began the first round, Scott Christensen was heard saying, "This is the greatest moment in the history of man. And I would know, I have a bachelor's degree IN history." The four rounds of the tournament included some great matchups, including two husband and wife pairings, two father and son matches, a nephew-uncle duel, and people fighting for rain cover under the awning of the fake jailhouse. There were a few upsets with underdogs winning out, but no one was really upset about the day, Especially Underdog (even though he wasn't invited). Players were ranked based on their score-relative-to-par average from the last five Minimasters and included, in order, Michael Cullen, Mick Cullen, Matthew Cullen, RJ Dusak, Dianne Cullen, Ursula Nieves Cullen, Stephanie Altergott, Josh Altergott, Carrie Donahue, Russ Dusak, Jake Heynis, Greg Powroznik, Lacy Dusak, Xavy Cullen, Eli Cullen, and Scott Christensen. With four guaranteed rounds of play, there were many opportunities for awards and prizes. Even if you lost in the first round, the 9th place trophy (which was suggested by some stranger in a gas station) gave those players placed in the repechage a chance at eternal MCMMI glory. Of course the fun didn't stop at the putting, some silly prizes offered those dressed in unique outfits or blessed with humor an opportunity at recognition as well. And of course who could forget the photo scavenger hunt!?!? (Well technically speaking, only the 16 people who knew about it did.) The day was filled with smiles, hole-in-one celebratory arm raises, and colored balls stamped with "MCMM Invitational 2014". At the end of the day, when the participation gifts, trophies, white tiles, thriftshop plate, and ugly t-shirt were given out, they could hear the cheering and laughing on the other side of Route 50 at the Brat Stop. Said the owner, "It's clear that the MCMM brand has done it again and that this end of the summer tournament will be a fixture for years to come." Thank you to all those who putted with me. 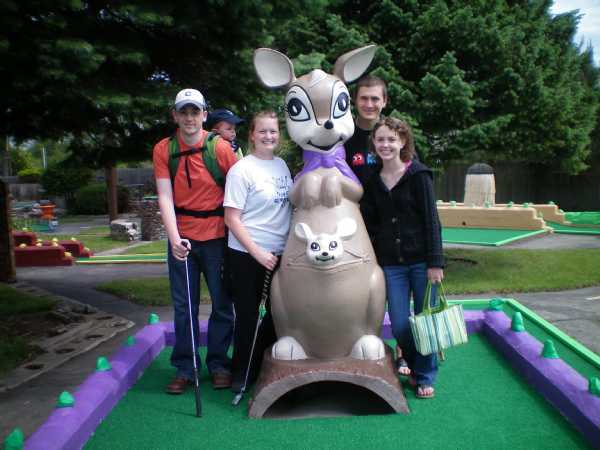 I can't wait to play tournament mini golf until next year (or in early Spring for that other tournament we were talking about.). See you then! The 16th Annual M.C. Mini Masters is upon us! Are you ready, folks?! This year's tournament features a record-tying 40 competitors, including 8 rookies, 4 people over the age of 60, and 3 people under the age of 12. All five former champions are in the field for the first time since 2007, and there will be six different courses again for the first time since 2009, thanks to the inclusion of Aloha Falls (formerly Libertyville Park District). The par is the lowest in MCMM history (266), so last year's impressive under-par totals will be hard to match. It's going to be a warm, potentially rainy day, so get ready for anything! See you on the 1st tee! 15th ANNUAL M.C. MINI MASTERS! Newly appointed co-director Matthew Cullen announced yesterday that there will be a new format for the 2011 M.C. Mini Masters tournament. The tournament will include two divisions, the aptly named Puttz Division for all past tournament champs and the Putterz Division for the rest of the MCMM field. Cullen stated the divisional breakdown would allow a greater chance for the general public to win the tournament. "The top four minigolfers over the past four or five years has remained pretty consistent. With only five different overall winners in course history, we thought it would be a great way to distribute more prizes in the tournament's big anniversary year. Of course if you are really serious and want to join the Puttz Division, it is open for anyone. It is required, however, for all past tournament winners. My father and I have been talking about all the awesome changes we would make to the tournament, but this really seems to be the one we stuck with. It has been in the works for a year and I recently decided to go ahead with the plan without even running it by my father first. As an adult, I don't have to ask his permission for everything. But it probably would have been nice to get his agreement in the matter." Cullen is referring of course to his father Michael who has been co-organizing the tournament this year as founder Mick Cullen stepped down from the role after last year's tournament. Cullen was unavailable for comment about why he chose to have brother and father Cullen co-direct the tourney this year. However, it is believed to have something to do with tacos. The divisional announcement came amid speculation that past winners have been involved in a putter tampering scheme. Recent allegations have come out that the Cullen men, as well as Tom Schweiss, have employeed various methods to increase putter performance, including corking putters, the use of bat tar past a certain point on the shaft of the putter, and rockets. 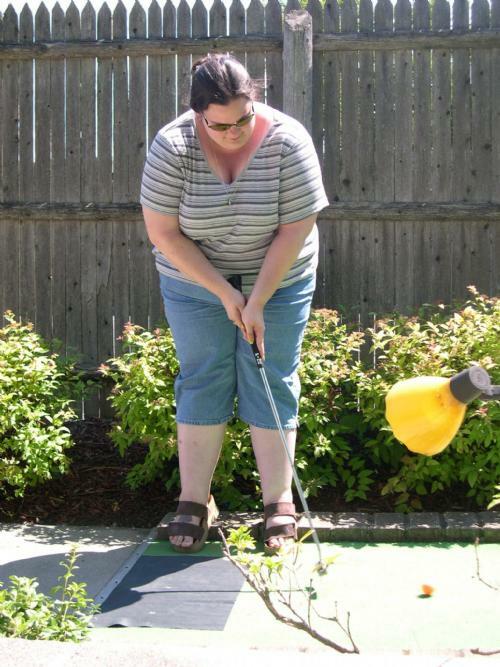 While the rules clearly do not address any of these aforementioned tactics, the rumors have had quite an impact on the miniature golf community and the MCMM champions themselves. When asked about the allegations and how he was dealing with the it all, three-time champion Schweiss stated, "....What? I'm fine. What are you talking about? Can I go back to my yacht now?" Clearly distraught, we can only guess as to what kind of impact this has on his young family. This same scandal may have been what drove one-time champion and perennial contender RJ Dusak not only from the tournament but from the face of the earth, never to be heard from again. When asked to comment, Cullen stated, "Who RJ? That's not true. I see him once a week for hockey, we're on the same team." Cullen is obviously delusional. After playing the newly-reopened Sisolak's West course in Beach Park this weekend, tourney director Mick Cullen has announced that the course lineup for the 13th annual M.C. Mini Masters is finalized. Though the course is still being rehabilitated, it is already in good shape and is expected to be fully ready by tournament day June 27. "It brought back a ton of memories to be playing the old west course at Sisolak's," Cullen said. "We are thrilled to welcome it back into the Mini Masters fold." Sisolak's West will replace the now-closed Congo River, and the relocated Rocky's Fun House in Waukegan will replace the one that was closed down in Gurnee. Sisolak's West's reentry means the Mini Masters still has three of its original six courses in the lineup. For the first time in history, the tourney will open at Action Territory. The starting time is still 9am, as the staff at Action Territory have been kind enough to agree to an extra-early opening to accommodate the Mini Masters' need to get an early start. Action Territory is now the only course that has been in the MCMM all thirteen years. After Action Territory, the merry parade will progress to Sisolak's for 18 holes. The west course returns to the Mini Masters for the first time since 2003. Lighthouse, in its 12th MCMM appearance, will host the third round. The new Rocky's Fun House makes its initial foray into the lineup for round number four, and the final two rounds will be played at Par-King in Lincolnshire again this year. Thirty-two players have signed up for the MCMM already, making it the largest field since 2005's record of 37. Entries are now capped at 36. With less than five weeks to go before the thirteenth installment of the M.C. Mini Masters, tourney director Mick Cullen has yet to announce the day's official schedule of courses. "A number of factors have complicated the process this year," said Cullen, "but the most significant is the closing of the annual opening course, Congo River." Congo River announced this winter that it had sold out to Honda, who will demolish the course in favor of an auto dealership. This leaves neighboring Action Territory in Kenosha as the only course which will have been included in the Mini Masters every year it's been contested. Lighthouse was banished from the lineup for one year, 2005, due to poor maintenance and upkeep, but returned the next year when ownership changed hands and the course was vastly refurbished. This means that Action Territory will open the 2009 Mini Masters-- a tough test with which to start the day, to be sure. From there, things get tricky. Rocky's Fun House's Gurnee location has been shut down, though they have opened another black-light indoor miniature golf course at their Waukegan location. It is officially a different course, as most of the holes do not mimic holes from the old Gurnee course. In all likelihood, the second course of the day will be Lighthouse, with the third round taking place at the new Waukegan Rocky's location. Kristof's in Round Lake Beach and Lambs Farm in Libertyville were both considered as potential sites for the MCMM this year, but each has been officially eliminated from contention. Cullen cited poor upkeep and occasionally hazardous playing conditions for the continued exclusion of Kristof's from the lineup in 2009. Lambs Farm's candidacy reportedly struggled due to poor conditions (including some cups filled with dirty water) and their unusually early closing hour of 5:00pm. There exists a good chance the tournament will return to Ballybunion (pictured above left) in Long Grove for the first time since their two-year stint in 2004-05. Despite their high price and ownership that, in the past, has been unresponsive to group rate requests, they are conveniently located just minutes from Par-King and have a number of challenging holes that test even seasoned MCMM veterans. Insiders say Cullen has already made one stop there this spring and plans another to see if the course is being kept up. It is also relatively certain the tournament will end with two rounds at Par-King in Lincolnshire for the second straight year. The locale proved to be a popular and enjoyable place to end the tournament last year, and their staff certainly made the competitors feel welcome. If the likely schedule is Action Territory, Lighthouse, Rocky's Fun House, Ballybunion, and two rounds at Par-King, what could potentially change that? There are two factors that may come into play. First of all, Cullen is reportedly still considering one oddball plan that could see the first two rounds played at Action Territory and Lighthouse, the middle two at Par-King, and the final two at Novelty Golf in Lincolnwood. 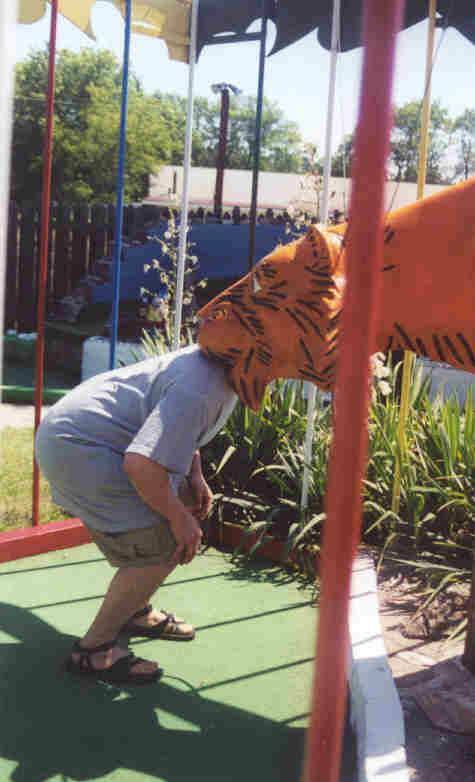 He is traveling to Novelty Golf next weekend to evaluate the viability of their courses for the tournament. Since this would entail more driving distance than any previous MCMM, Cullen has said he would need to feel a very compelling case could be made for Novelty Golf. The second possibility is one that would excite many Mini Masters veterans. Sisolak's Golf-a-rama in Beach Park has been purchased and is currently being rehabilitated. The property has an "Opening Soon" sign up, plenty of fresh paint has been applied, and new greens have been laid on all 18 holes of the west course. "It looks like they could have the west course playable by tournament day," Cullen said, noting that the east course was still in complete disarray and he didn't see its completion by the end of June as a possibility. "Still, even just the glimmer of hope that Sisolak's could reenter the tournament in 2010 is a reason for all MCMM players to be excited." Cullen said he plans to make a final determination on the course lineup by June 6. Keep checking the official M.C. Mini Masters website for details. Rocky's Fun House, the third course of the Mini Masters for each of the last four years, has closed its doors permanently. This makes it the fourth MCMM course to shut down during the tournament's history and the second to both open and close since the Mini Masters started in 1997. Potential 2009 replacements for Rocky's include two former MCMM courses, Kristof's in Round Lake Beach and Ballybunion in Long Grove, as well as Lambs Farm in Mundelein. 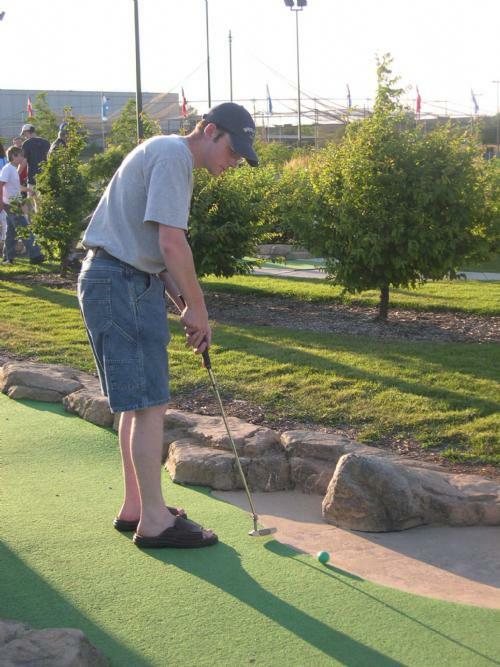 The price of the tournament may be lowered to $45 and the group will likely seek lunch at an eatery near Lighthouse Miniature Golf in Waukegan. Tom Schweiss (elegantly pictured at right) won his second M.C. Mini Masters title Saturday. I knew you guys would want a story here, but I'm too tired to write one right now. I'll write one later. Yay Tom! Bob interviews Mick Cullen, MC Minimasters tournament director and 2002 Champion. Bob: Umm....What am I interviewing you for? Mick: I think it would be about the 12th annual MC Mini Masters tournament we are playing in a couple of weeks. Bob: Who’s Emcee Minimasters, and what kind of tournament is it? Mick: MC as in the initials of my name, not an M.C. that spins records, and the tournament is for miniature golf. Bob: Oh, so you’re the DJ. Is it like a miniature golf dance-off? Mick: I’m not a DJ and it’s a six-course miniature golf tournament played in one day. 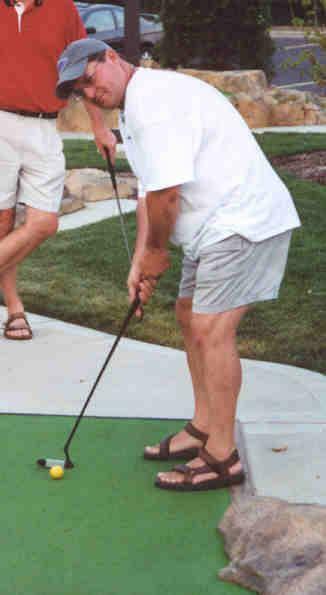 Bob: Wait...I don’t think any clubs will allow you to play miniature golf while people are dancing. Mick: The clubs we will be using are putters. You’re sidetracked and not paying attention. Bob: You’re just talking crazy. You can’t bring putters into clubs, you’ll put somebody’s eye out! Mick: I’m gonna put your eye out, moron. Bob: Okay, psycho. So tell me why this is the 12 annual tournament dancing golf thing. Mick: Umm....cause this is the 12th time we’ve done it....and it has nothing to do with dancing. It’s just miniature golf. Played at six different courses. One day. There will be 24 people participating. We have awards for best overall score, most holes-in-one, most sixes, rookie of the year, most improved, best score for each course, and most improved for each course. Bob: Are the awards like cash money? Mick: No, each award will get a trophy of some kind. Of course the overall tournament winner will also get the Ugly Jacket. It’s our version of the Masters' Green Jacket. Bob: You mean the Green Jacket isn’t ugly? Mick: Well....that's a good point, actually...it is ugly, but it’s not the same ugly jacket we use. Bob: Okay....I missed something in there....oh well....So what day is this “dance the ugly jacket off a golf course” taking place? Mick: For those of you who are paying attention, the tournament will start in Kenosha at Congo River at 9 AM, and will finish in Lincolnshire at Par-King around 10:00 PM. We will have a pizza lunch at the third location, the cost of which is paid by part of your entrance fee. Bob: OH! So it’s like a golfing pizza disco dance party! How much is the cover charge? Mick: You’re an idiot...the fee is $50. There are some spots still available if people are still interested, but they should reserve their spots quick. You can’t come. Bob: (to a radio tech) $50, this guy’s nuts, no one is going to pay that much money to dance on a golf course. I don’t want to go anyway, I can do that for free. Radio Tech: (whispering) Bob, shut up and finish the interview before you make us all dumber. Mick: No, MICK, with an M.
Bob: Nick isn’t spelled with an M.
Mick: No but my name isn’t Nick. Tournament director Mick Cullen announced today that for the first time, the most improved golfer on each individual course will be honored with a trophy this year. The awards will be given out at the end of the day in the closing trophy ceremonies. How will they be doled out? Read on! First of all, anyone who was won or tied for the low score on a course in a previous MCMM is forever barred from receiving a Most Improved trophy for that course. Secondly, the overall Most Improved golfer of the year cannot take away any individual most improved trophies. After those individuals have been eliminated from contention, the non-rookie player who shot a round the most strokes below his/her previous best score on that course will receive the Most Improved trophy for that round. Tiebreakers, if necessary, will be the same as those used to determine scratch winners of each course. Since there are two new courses in the Mini Masters this year, that means that four of these new trophies will be awarded in 2008. Happy May Day, everyone! The Mini Masters has finalized its course lineup for the 12th edition of the tournament, scheduled for Saturday, June 28, 2008. As always, the day will begin at 9:00am at Congo River in Kenosha, Wisconsin, followed by round two at Action Territory right next door. From there, we will travel for a fourth year to a course that is now operating under its third different name: Rocky's Fun House in Gurnee. The decorations have changed, but the holes haven't. Par has also been established there as 46, including the first ever par-one hole in Mini Masters history (the 18th), which now has different scoring than ever before. After a pizza lunch at Rocky's, the merry parade moves on to Lighthouse in Waukegan, enjoying its 11th Mini Masters out of 12. That's where things get different. We will be playing our fifth and sixth rounds at Par-King in Lincolnshire. Round five will be on their Black Course, and the final round will use their Red Course. The 18th hole roulette wheels will not come into play, as the designated Wacky Hole on each course will be played once in Wacky Hole style and once in regular style. If you haven't played Par-King, you're in for a treat. Sign up for the Mini Masters before it's too late! Tournament Director Mick Cullen announced today that the Red Course at Par King in Lincolnshire, Illinois has been named the final course of this year's M.C. Mini Masters. Par King replaces Libertyville Sports Complex, the final course in five of the last six installments of the tournament, which closed its doors permanently last August. Additionally, Cullen noted that Kristof's in Round Lake Beach was in danger of once again losing its spot in the lineup due to poor course maintenance. An unnamed course is being considered for the fifth stop of the day. If that course does not work out and the maintenance problems at Kristof's are not resolved, it's possible the Black Course at Par-King could be employed instead. A final decision will likely be made in the next month. The 12th Annual M.C. Mini Masters is scheduled for Saturday, June 28, 2008. Defending champion Matthew Cullen is set to defend his Ugly Jacket against a field of 30-36 putters. The 11th annual MC Mini Masters saw Matthew Cullen win the year after his father for the second time in seven tournaments. Michael Cullen, who won the tournament last year and five times before that, including the first four Mini Masters, is no longer the only person to have won the tournament more than once. Matthew just edged out RJ Dusak by one stroke to take the trophy with 25 strokes under par, one stroke more than his personal best in the tournament. His triumph this year comes after an article in Pioneer Press showcased the tournament and the Cullen family’s love for miniature golf earlier in the week. 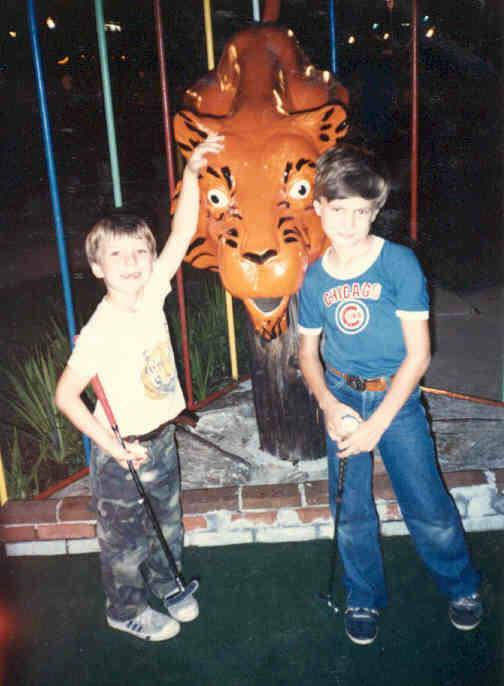 The last time the Mini Masters was featured in a newspaper, Matthew won his first tournament title, shooting 18 under par and beating his brother Mick Cullen by one stroke and Chicago Tribune columnist Eric Zorn by two strokes. The day started out with Dusak and Tom Schweiss both shooting 41 at Congo River, with Schweiss getting the trophy due to more holes-in-one. Matthew Cullen and Dan Lee were one stroke off that lead, while Stephanie Altergott and newcomer Ursula Nieves were only one stroke behind them. Schweiss continued to have the hot putter, carding a 40 at Action Territory, tying the record for that course and establishing his lead over the field. Matthew and Dusak shot a 43 and 44 respectively, putting them in a tie for second overall. The only other score of par or better at Action Territory was shot by Mick Cullen with a 46. People’s Choice gave way to the first sub-40 rounds of this year’s tourney. Dusak took the course trophy with a 37, with Matthew and Elisa Cullen getting 38s, and Mick and Michael shooting 39. The breakdown of the leaderboard had Dusak in front, with a one-stroke lead over Schweiss and Matthew, Mick in fourth 6 strokes behind his brother and Tom, and Lee in 5th with Michael trailing him by one. Lighthouse also allowed sub-40 rounds, with Matthew winning the course title this year with a 37, and Michael and Lee each shooting a 39. Kristof’s was host to the first time in tournament history in which the winner was determined by the second tiebreaker, most holes under par. It was also the first course to be won by a former Most Sixes winner, Lisa Curran, who put up an impressive 41. Michael also shot 41, with Mick shooting a 42 and Dusak shooting a 43. The final foursomes were thus determined and set the stage for an amazing final round. It was almost guaranteed there would be a repeat champion as all five of those who sat atop the leaderboard had won a previous tournament. In fact, the final foursome consisted entirely of former champions for the first time in an MCMM. Libertyville has been the bane of many tournament-goers' existence (or at least a pain-in-the-neck on tournament day) since its inclusion in 2002. Dusak scored a four on the first hole at Libertyville to fall three back, but was able to rally to tie it back up following a two at the Wacky Hole, the 11th. Dusak looked like he'd fall out of that tie after his tee shot at 12 found the gap on the bridge, but he was able to score a 4 to Matthew Cullen's 5 as Matt ended up out of bounds after his second shot. Matthew tied it up on the 13th when an unlucky bounce off a rock on the 13th hole put Dusak in a precarious position, forcing him to take a three, while Matthew sunk a nice shot from the sand trap to give him a two for the tie. On the 13th, Cullen got it through the wrong log, but still bested Dusak, who was unable to shoot the ball down either log, unluckily ending up with the ball directly between the two logs. Matt sank a long putt for a two to Dusak's three and had the lead with four holes to go. After missing a long putt for two that would have tied it up on 17, it came down to the 18th again for Dusak. Matthew went ahead of him and scored a quick two. Unlike the ace he needed to secure his championship over Schweiss in 2005, RJ needed a hole-in-one just to tie Cullen and force a playoff. The rock, however, was not in his favor this time and he had to settle for a two and second place in the tournament. Libertyville had a three-way tie for first, with Schweiss, Dusak, and Matthew all shooting 45. The title for the course had to go to the second tie-breaker for the second time in the tournament and the second time in Mini Masters history. With Schweiss and Dusak each getting one ace on the course, it was determined that Dusak had more holes under par, giving him his second course trophy of the day. Schweiss was third overall for the day with 19 under par and Mick finished with a 13-under score to take fourth. Since Matthew won the tournament, he was excluded from the holes-in-one trophy race, which went to Schweiss with 6 aces. Most sixes went to Michael Arf, who took the birdhouse with only 10 sixes, the second-lowest winning total in MCMM history. Rookie of the year went to Ursula Nieves, whose highlight was an impressive 43 at the opening course of the tournament. The most improved trophy went to Dan Lee, as he shaved 31 strokes off his previous best tournament score. The top ten included Michael Cullen in fifth place with 9 under, Lee in sixth with 6 under, Stephanie Altergott and Elisa Cullen tied in seventh with 5 over, Carrie McGowan in ninth with 7 over, and Karen Kemnitz rounding it off at tenth with a 14-over finish. Altergott was battling the sickness of her pregnancy throughout the day and was still able to post a score in the top ten, breaking the previous record for score and ranking by a pregnant player (held by Elisa Cullen). The 2008 M.C. 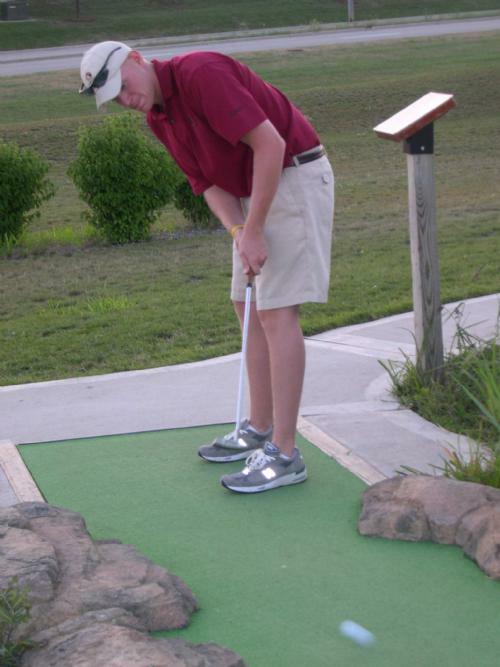 Mini Masters, with one course in the lineup yet to be determined, will take place on Saturday, June 28, 2008. The 11th annual M.C. Mini Masters, scheduled for June 30, 2007, will feature the same course lineup as the 2006 tourney, marking the first time the tourney has kept the same course lineup in back-to-back years since 2002-03. However, it also will be the end of Libertyville Sports Complex's involvement in the MCMM, as the complex's devilish miniature golf course will be closing in August, bought out by a commercial developer. 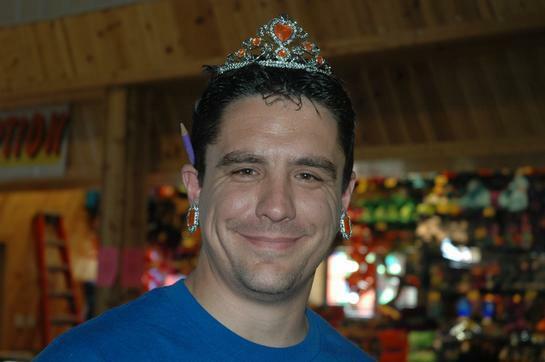 2002: In the first year of Libertyville's involvement in the MCMM, tourney founder Mick Cullen comes from behind in the last round to upend his brother, defending champion Matt Cullen, to win his only MCMM crown. 2003: Tom Schweiss takes his only MCMM title, but not before seeing a 7-shot lead with 12 holes to go melt away to nothing with three holes remaining, then besting hard-charging Dale Hanson by a stroke on the 16th and tying him on the 17th and 18th to take the championship by one. 2005: Karen Kemnitz records the Mini Masters' 1,000th hole-in-one on Libertyville's 2nd hole. To date, her ace remains the only one on that hole in MCMM history. 2005: R.J. Dusak records the most important, clutch hole-in-one in tournament history, acing Libertyville's 18th (pictured above left) to win the tournament by a single stroke over Schweiss. 2006: Michael Cullen breaks his own tournament record for low total score by posting a 43 at Libertyville for a total score of 243, 32 under par, as he wins his sixth Ugly Jacket. Libertyville will thankfully still be open for play on June 30. It will serve as the tournament's closing course for a fifth and final time. Kristof's is the only other course to serve as an ending location for the tournament, doing so the other six years of the MCMM. Next year, the closing course is likely to be one that is brand new to the Mini Masters. This year's field will include five M.C. Mini Masters champions and at least 24 other players. As of May 31, twenty-nine players have committed and several others are interested. The other courses involved this year, as in 2006, are Congo River, Action Territory, People's Choice (formerly Monster Golf), Lighthouse, and Kristof's. Congo and Action will be celebrating their 11th year of inclusion in the MCMM, Lighthouse its 10th, Kristof's its 9th, and People's Choice its third. The entry cost of the tournament this year is again $40. If you are interested in playing in the Mini Masters, contact Mick Cullen at mcminimasters@netzero.com. Apparently Michael Cullen is not content to have only half of all Mini Masters championships. For the second time in three years, Michael (pictured at right) refused to let his career winning percentage fall to a mere .500, taking his sixth M.C. Mini Masters title in the tourney's ten years. To top it off, Michael broke his own career scoring record by posting a 32-under 243, 20 strokes better than last year's winning total and a full 15 strokes ahead of second place finisher Mick Cullen. On the hottest day in tournament history, Michael never trailed, becoming the first wire-to-wire winner since he accomplished the feat in 2000. He tied the tourney record with a 38 at Congo River, one stroke ahead of Aaron Hanson, and he was just getting started. Matt Cullen broke the Action Territory record with a round of 40, climbing to second place, two strokes behind his father. Aaron Hanson sat four strokes back and Mick Cullen six behind at that point. Tom Schweiss jumped into the fray by successfully defending his title at Monster Golf with a 40. The only other player under par on the course was rookie Mike Halls (42), with Michael and Mick Cullen and Schweiss's wife Julie shooting even-par 43s. Perennial contender Dale Hanson became a casualty of the heat after the indoor round at the Monster, withdrawing due to dehydration worries. The field was thereby trimmed to 26, its lowest since 1999. Lighthouse was next, making a return to the tourney lineup after a one-year hiatus. What a return it was, as Lighthouse played host to some tournament history. First of all, Michael Cullen had a virtuoso putting performance, carding a 36-- the 2nd-lowest round in MCMM history and a new course record. However, he was overshadowed by Stephanie Altergott, who was playing the tournament of her life, making an historic circuit at the Waukegan course. Altergott became the first person in Mini Masters history to record five holes-in-one in a round as she shot a 37-- the first-ever sub-40 round by a female. Unbelievably, her record-breaking fifth ace came on the 10th hole, a hole no one in MCMM history had ever holed in one. Her other aces included a Wacky Ace at the 11th, back-to-back aces at #3 and #4, and almost as astounding as her ace of the 10th, a hole-in-one on the 13th. The 13th hole had not allowed an ace since 2003, and in fact, had surrendered only three aces in MCMM history-- one to Altergott herself in 1999. Altergott also pushed herself all the way up to second place entering the fifth round, just ahead of Mick Cullen and Tom Schweiss. Her five aces also gave her ten through four rounds, tied for the MCMM single-day record. Also at Lighthouse, rookie Kim Zambole made MCMM history by acing the 16th hole to become the first-ever player to pull off an Ace on Demand. Zambole had drawn the 16th hole as one of her three potential prize holes at the day's inception. Mick Cullen took home his first course title trophy in 3 years by tying the course record at Kristof's, posting a 38. Unfortunately, Michael's 40 meant Mick gained only 2 strokes and his father entered the final round with a 10-stroke lead on the field. With little drama other than whether he would break his own scoring record, Michael calmly shot a 43 to garner his third course title of the day and break both the record for most strokes under par (32) and best stroke total (243). Mick Cullen finished in second at -17, Tom Schweiss in third a stroke behind him, Matt Cullen in fourth at -10 and Stephanie Altergott took fifth with a total of 8-under. Altergott became the highest female finisher since Dianne Cullen took 5th (also out of 26) in 1999. The only other players to finish under par were Aaron Hanson (-2, 6th place) and Jason Gola (-1, 7th). Carrie McGowan (+6, 8th), Dianne Cullen (+8, 9th) and Dan Lee (+16, 10th) rounded out the top ten. Lee and Altergott joined Michael Cullen with the distinction of posting their career-best scores, a claim also staked by Julie Schweiss, Mary Kemnitz, Michael Arf and Katie Wood. Arf took home the Most Improved trophy by slicing 47 strokes off his previous score, beating out Mary Kemnitz (42). Mary, however, made an historic improvement of her own: she became the first Most Sixes winner to go sixless in her very next tournament appearance. Stephanie Altergott took home the Most Holes-in-one title with the aforementioned record-tying ten, while Katie Wood won the Most Sixes birdhouse in a tiebreak over Kim Zambole. Wood's total of 8 sixes was the lowest birdhouse-winning total ever, edging out Kemnitz's nine in 2003. A final note of interest: coming into this tournament, there had been 96 people who had successfully completed at least one M.C. Mini Masters. This year's four rookies made it an even one hundred. The last rookie to complete his final round was Wil Zambole, who therefore holds the distinction of being the 100th player to finish an M.C. Mini Masters. He came in twelfth place at 18 over par. He was awarded a medal for this unique place in MCMM history. Due to the extreme heat, Mick Cullen announced plans to move the Mini Masters to the end of June next year. Tournament director Mick Cullen announced today that the M.C. Mini Masters was making a lineup change with the tournament less than one month away. 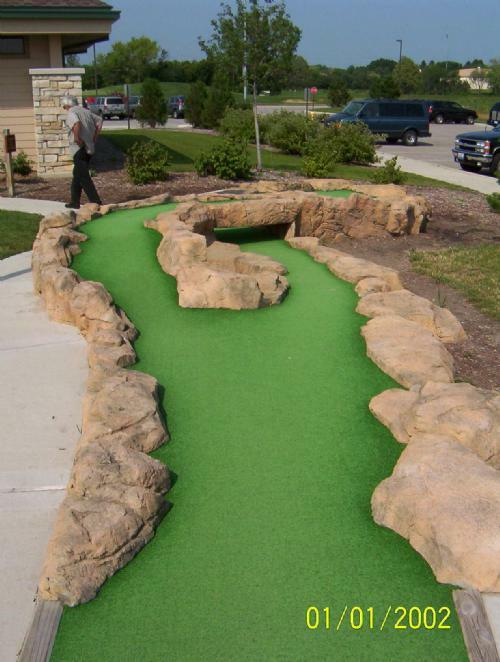 Ballybunion in Long Grove is out, and original MCMM course Lighthouse Miniature Golf, in Waukegan, IL, is making a return to the tournament agenda. "This decision was more about eliminating Ballybunion than rewarding Lighthouse," said Cullen. "A number of factors led to this. However, I know that MCMM veterans are familiar with Lighthouse and will be comfortable with this decision." Insiders say Ballybunion fell short in a few key areas. First of all, their revolving ownership has been a concern. Ballybunion is under new ownership for a second time since 2004, and the current owner/managers have been delinquent in returning phone calls made by tournament organizers. Additionally, the course's price is the highest of any of the layouts involved in the Mini Masters, a whopping $7.50 per round. Ballybunion has historically failed to give a good group rate to the Mini Masters, and this year, failed even to respond to phone calls. Sources say Cullen prefers the layout and style of Ballybunion to that of Lighthouse, but the higher price (50% higher than Lighthouse's price of $5.00) necessitates a better group rate than the course has given in the past. Since Ballybunion is also the course furthest to the south, it is logistically the easiest course to eliminate as well. "I do not rule out the Mini Masters returning to Ballybunion in the future," Cullen said. "Lighthouse poses some concerns as well." The Waukegan-based course was eliminated from the Mini Masters last year due to poor upkeep. There remain some heavily worn holes and similar concerns with Lighthouse, but for now, it is back in the Mini Masters. The return of Lighthouse also means the return of its much-despised 5th hole, statistically the toughest par-3 hole in MCMM history. The aptly-nicknamed "Hill of Death" has caused far more 6s than any other Lighthouse hole. Lighthouse makes it four original MCMM courses that are in this year's lineup. The only lacking courses are the East and West links at Sisolak's in Beach Park, which remains closed and up for lease. Those courses have been replaced by Libertyville Park District, the closing course for three of the last four years, and Monster Golf, the newest member of the club both in terms of course age and length of involvement with the tournament. With the tournament less than 50 days away, tournament director Mick Cullen announced today that the M.C. Mini Masters, entering its 10th year of existence, intends to have the same six-course lineup it featured last year, with Monster Golf remaining in the mix and Libertyville hosting the closing round. As usual, the putters will open the day at Congo River and Action Territory in Kenosha, WI. They are the only two courses that have played host to every single Mini Masters. 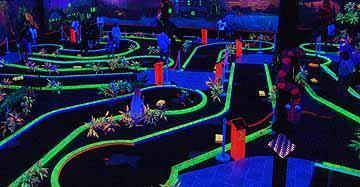 The newest MCMM course, Monster Golf in Gurnee, opens the Illinois leg of the day and provides lunch. Kristof's, Ballybunion and the aforementioned Libertyville comprise the second half of the day's festivities. Cullen promised some new Wacky Holes will be on the agenda this year, along with some prizes that will go unannounced until tournament day. "It's the 10th Mini Masters, so we will be making it special," he said. "The most unique miniature golf event in the world will be even more so this year." The 10th annual M.C. Mini Masters remains scheduled for Saturday, July 29, 2006. Veteran registration is underway. Notably missing will be defending champion R.J. Dusak, the first-ever champion not to defend his title. Seven-year veteran R.J. Dusak (Antioch, IL) won the ninth M.C. Mini Masters on Saturday with a flourish, acing the 108th hole to beat out 2003 champion Tom Schweiss (Ingleside, IL) by a single stroke. USPMGA Vice President Gary Shiff (Yonkers, NY) won the inaugural Pro Division of the tournament, which also came down to the final hole of the final round with one player needing an ace to win; however, runner-up Tom Dixon (Kansas City, MO) was victimized by an unlucky bounce that left him with no real shot at the two he needed to tie. Dusak had held a seven-stroke lead over 2001 titleist Matt Cullen heading into the final round with five-time champ Michael Cullen in third and 2002 winner Mick Cullen tied with Schweiss in fourth, but struggled in the final round while Schweiss sizzled. Dusak had a respectable 25 on the front 9 at Libertyville, but a six on the 12th hole caused his lead to shrink. Dusak took eleven strokes on the next four holes before a bad tee shot at the 17th put him in a position that he was unable to escape with better than a four. Though the Cullens were unable to make a serious push, Schweiss and Aaron Hanson both bested the previous tourney course record. Schweiss's 41 was enough to put him a stroke ahead of Hanson, who posted a 40 to beat his father Dale Hanson's previous record of 42. Dusak heard of Schweiss's score before the final hole, and asked Mick Cullen to confirm what he already knew--that he needed to get a two on the final hole just to force a playoff. Matt and Mick Cullen then told Dusak to simply ace the hole so he wouldn't have to worry about a playoff. The 18th hole at Libertyville (seen at left) can only be aced by hitting the ball up onto a somewhat narrow S-shaped ramp and getting a friendly bounce off a border rock at the bottom of the ramp. With only a small portion of the gallery knowing the situation, the remainder of Dusak's foursome shushed the crowd. His tee shot ran perfectly up the ramp and down the slope, got that requisite friendly bounce and hit the cup dead center for a closing hole-in-one that brought down the house. The Cullens all high-fived Dusak, congratulating him on the most dramatic win in Mini Masters history, as he posted a total of seven under par. Schweiss was unaware how close he was until after that ace, as was Aaron Hanson, who finished just two strokes back of the lead in 3rd place. Dale Hanson settled in at fourth, four back at -3, and took home the Most Holes-in-one trophy with seven aces. Michael and Matt Cullen tied for fifth at -1, Mick Cullen was in seventh at +1, Carrie McGowan was in eighth at +7 and Russ Dusak in ninth at +8. McGowan took home the Most Improved trophy and was the low-scoring female for the day. 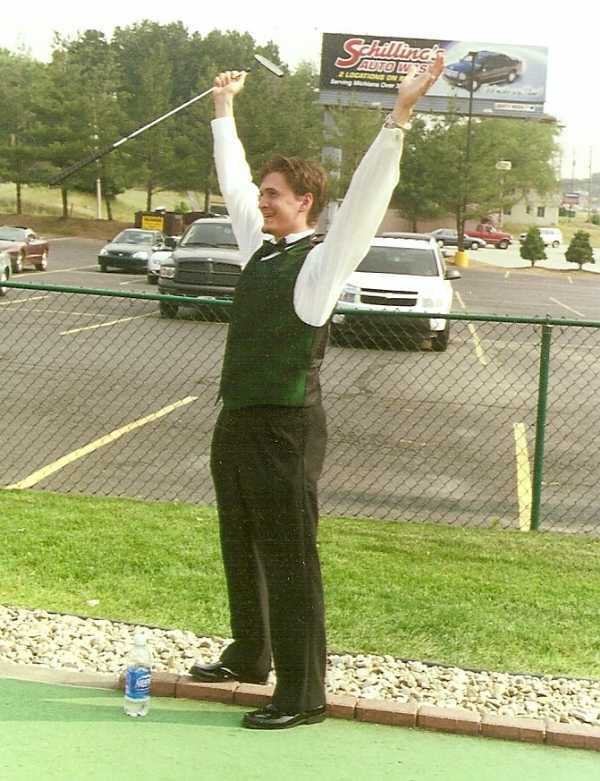 Matt Landt rounded out the top ten at +9, becoming the youngest player ever to finish in the top ten and also making history as the first former Most Sixes title holder to finish in the top ten. Jeff Bull took home the birdhouse for Most Sixes this year, finishing in 37th place overall. As mentioned earlier, Gary Shiff won the Pro Division of the tournament, but like Dusak, had to weather a late falter in his play to do so. With the tournament seemingly locked up, Shiff missed a series of two-foot putts and ended up taking a seven on the final hole. Tom Dixon knew an ace like Dusak's would wrap up the first pro Mini Masters title for him, and like Dusak, he put a shot right up the center of the ramp. However, once at the top, the ball bounced up onto the bordering rocks, down below to the lower level, off the bordering rocks again, and eventually found its way onto the putting surface with a series of unbelievable caroms. This left Dixon with an impossibly long and treacherous attempt at a bank shot that fell well short of its goal. Wayne Keller (Madison, WI) finished in third among the pros. Course champions included R.J. Dusak (Congo River), Matt Cullen (Action Territory), Schweiss (Monster Golf), rookie Pilar O'Brien (Kristof's), Jason Gola (Ballybunion) and Aaron Hanson (Libertyville). O'Brien became the first rookie to take a course title since Roger Johnson in 2003. A final note of interest: Karen Kemnitz's ace on the 2nd hole at Libertyville was not only the first ever to be recorded at that hole, it was also the 1,000th in M.C. Mini Masters history. Kemnitz received a crystal golf ball on a marble base for the accomplishment. Little did Matt and Mick Cullen know back in the late 1980s that all their practice conquering Sisolak's Golf-a-rama would come in handy! They both won MC Mini Masters titles (Matt 2001, 2007, and 2010; Mick 2002, 2011, 2012, 2014, and 2016). Matt was, unfortunately, eaten by the Sisolak's tiger last year.